For centuries, the swan has been the favorite subject of poets, musicians and artists. It symbolizes perfection, beauty and grace. Small wonder why “Swan in the lake” is such a beauty to behold. It is both perfect and graceful. A picturesque scene plays out across the tapestry. A pristine lake is in the foreground surrounded by some stands of trees. In the far background is a village. A small bridge crosses the lake to lead visitors to it. But what catches the eye is the two white swans, swimming peacefully by the shore. They beckon us to relax and appreciate the beauty of nature before moving on. 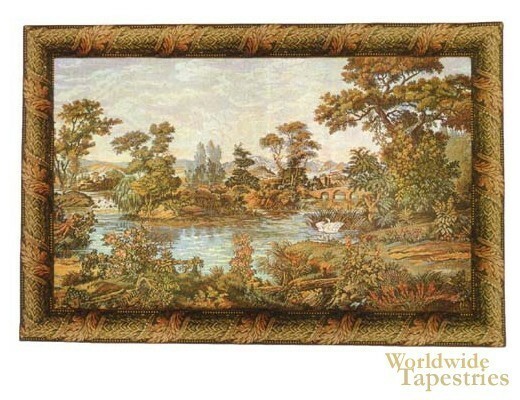 This tapestry was inspired by a drawing from the 17th century. “Swan in the lake” comes lined and has a tunnel for easy hanging. Dimensions: W 36" x H 22"
Dimensions: W 52" x H 32"
Dimensions: W 62" x H 28"